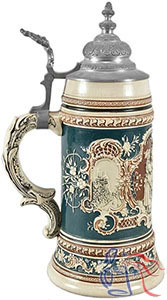 Although this stein is entitled “Weidmannsheil” (Hunter’s greeting) in the mold, the central decoration is actually taken from an 1877 painting entitled “Abschied von der Sennerin” (Parting from the Herdswoman) by Franz Defregger (1835-1921). Full-color versions are sometimes found with both Thewalt and HR (Hauber & Reuther) marks. See also Nos. 68, 148, 204, 238 and 364.